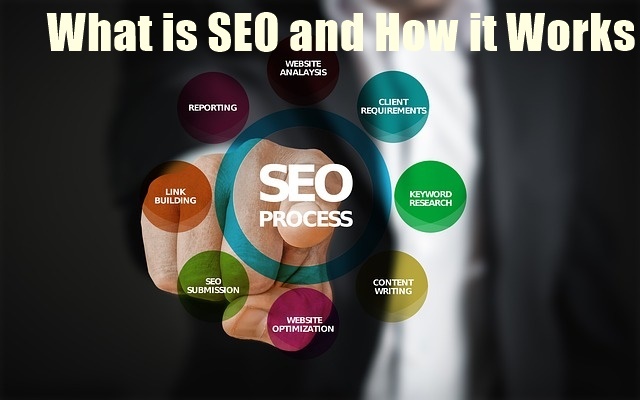 What is SEO and How it Works? : These are some of the questions that keep roaming in the minds of every webmaster or blogger, especially in the minds of new people, newbies providing content in the digital world. Topping in the field of Content Marketing, that is to note the answers to these questions not only to get the first page of Search Engines but also to be aware of how to do SEO in blogging. To come to the first page of Google or other search engines, articles need to be optimized correctly because the Visitors mostly visit those same posts which rank on the first page of the search engine. To do all this, knowledge of SEO is important. In order to succeed in blogging, to rank the articles with quality content, that is to increase traffic to the site, and what is the purpose of this blog? It is necessary to keep information about. SEO is such a big topic that has many factors, and talking about every aspect of it is not possible in a post. SEO is not any fix anyway, it varies according to Google algorithms but there are some basics of SEO that are always the same. If you are serious about blogging and marketing of your content then this post is for you. In this post, we will learn about the fundamentals of Search Engine Optimization and how it works. SEO is a process that affects online visibility in the search engines of a blog, website, or webpage, without any paid results. Simply put, Search Engine Optimization is a way to optimize your online content or blog posts so that the search engine can show that post or content on a keyword in the top result. When we talk of SEO, here are two parts. One is the search engine and the searcher on the search engine! Suppose your blog has an article that explains' How to Create a Blog on Blogger'. ... So you will now want that when a user searches on the keyword 'Create a Blog' on Google, the article on your blog or site will appear in the top result on Google. The top results in Google come to look for Search Engine Optimization. If your article is useful for users, relents and users, SEO is like magic on which you can show your post on Google in 1st page for 'Create a Blog' keyword. If your site/blog is SEO optimized and providing quality content, there is a high chance that it will rank at the top position on Google. If you succeed in doing this, income increases as well as increase traffic on your blog. Regarding SEO, we can say that it is directly related to search engines and it tells about how to bring blogs or websites to the top of Google in search engines. This was information about What is SEO. Now let us know about Types of SEO. Both of these are different but to be successful in blogging, it is important to be careful about both. On Page 'search engine optimization is a process for optimizing a website or blog for search. In this, the website is used to make search engine friendly. In simple words, something like this can be defined - all the things that we do on the website, which improve the ranking of the website, comes under the On Page SEO. Quality Content, Keyword Researching, Site Speed, Page Structure, Url Parameter etc. There are some factories that come to on-page SEO. Here we will talk about some key factors that are included on On-Page SEO and these are search engines & user-friendly. 1. Content- As it is said, 'content is king' and it is also right because a visitor is happy when he gets the correct cut. So never compromise with the quality of content. So, write good content for your viewers, do not copy-paste from anywhere, because this is the thing that will stop users on your site and compel them to revisit. 2. Keyword Research- This is a factor that is quite confusing, but selecting the right keyword is essential in posting, so before post writing, select the right keyword that is beneficial. 3. Post Title- Post Title On-Page SEO is a very important thing. Using the target keyword in the title, remember the use of modifier words, title length should be considered. 4. Site Speed- Better on page SEO, blog or website loading speed should be good so that visitors can access the site quickly. Keep in mind that the loading time of the website should not be more than 3-4 seconds. You can check Site Speed from GTMetrix.com. Apart from these, there are more things that affect On Page SEO such as post URL, linking, alt tag, description, headings, keyword density, responsive design, user intent etc.! A detailed post about all of these will come soon. stay tuned. The work done outside of your website or blog that affects the result page for your website in the search engine comes in Off Page SEO. It can be defined as something - the activities outside the boundaries of the website which increase the rank of website or blog and the page rank in the search engine, called off page SEO. On Page, SEO is done on the website while off-page SEO is out of the website. Off-page optimization mainly comes from blog promotion. For example, social sharing, commenting etc. If you are posting a guest on a blog then this off page is a part of the HOO. Let's know about some off page optimization tips for blogs that are beneficial for blogs. 1. Link Building- This is a method that every blogger should adopt. Guest blogging link building is a great way. This gives you Do-follow backlink which is very important in blogging. Backlinks always from high-quality site Make your blog come niche. 2. Blog Commenting- You can comment on your blog from the related blogs and link it to your website. Avoid spam commenting. 3. Social Sharing- Social media is a huge platform from which you can find tremendous traffic for your blog. Create pages, groups, etc. on your blog or website's social sites and share your content. 4. Join Q & A Forums- Join forums such as Quora, ask.supportmeindia.com, and help people there, while promoting your site, submit a link. Some more off-page optimization tips such as Bookmarking, Directory Submission, Pinning etc. 2. Black hat SEO- keyword stuffing or another website ranking in ways that are not in accordance with Google's terms. Gray hat SEO is also among these two types. Why SEO is important for blogs? The purpose behind creating any website or blog is to publish content or services to be published to the public. It is easy to create a website or blog but it is a bit difficult to get it in the top result in the search engine. SEO is the best method that can bring your website to the search engine and increase its search preference. Regardless of how hard work can be done on a website but getting SEO without results, learning SEO and its basics are essential for any webmaster or blogger to remain in the online world. SEO presents your content easily in the online world, and search robots can easily understand the content. Most internet user only see the top results shown in the search engine, therefore search engine optimization is important as it can not rank in Google's first page and can not increase traffic to the blog or website. If you optimize your content well then it enhances the user experience. Through the search engine, optimization blogging competition can be hindered. This gives a great improvement in the traffic of the blog or website. If you optimize content with quality, then rank them on the first page in the search engine, then it is likely that another blogger can post your post or content link on your post or blog. This increases the blog's authority and benefits blogs in many ways. Hopefully, you have come to know from this guide that search engine optimization is not optional for any website or blog but it is very important. If you know the significance of these three words, then it can take a look at the online presence of your blog or website. So if you do not know or know less about SEO then start learning from today and start implementing it in your blog or website. This is the process that can help the beginner or anyone to take the blog to the next level. Hope you guys liked this post in which we know what is SEO and why it is necessary? about. If you have any questions related to this, then definitely ask in the comment box.